This story was updated at 10:40pm US eastern time. Indonesian authorities confirmed today (Oct. 29) that a Lion Air plane carrying 189 people traveling from Jakarta to Pangkal Pinang, near the island of Sumatra, has crashed. Authorities said it’s unlikely that there are survivors. So far, six bodies have been recovered from the Java Sea near the crash site. Here is what else we know so far. The flight, Lion Air JT610, lost contact 13 minutes after taking off from the Indonesian capital at 6:20am local time, before crashing into the sea. According to Indonesia’s National Search and Rescue Agency, the plane was at an altitude of about 3,000 feet. The pilots made a request to turn back about 12 miles (19km) out from takeoff, but did not signal that there was an emergency, Yohanes Sirait, spokesman for AirNav Indonesia, told CNN. Yohanes added that JT610 would have been given priority landing, but air-traffic controllers lost contact shortly after. Radar showed that the plane did not attempt to turn around. Boeing said in a statement that it ”stands ready to provide technical assistance to the accident investigation.” Lion Air, a domestic low-cost carrier, purchased 50 of the Boeing jets (paywall) in April, on top of the 200 planes it ordered from the company in 2011, as carriers in Southeast Asia compete to meet rapidly growing demand for travel in the region. The accident is the first one involving the 737 MAX, a new, more fuel-efficient model introduced last year, according to Reuters. Indonesia’s aviation industry has suffered from a poor safety recordfor years. There were 189 people on board flight JT610. This includes two pilots, six additional crew members, two babies, one child, and 178 other adult passengers. Indonesia’s Finance Ministry confirmed that there were 20 ministry officials on board. The officials were returning to their posts in Pangkal Pinang after visiting their families in Jakarta for the weekend, finance minister Sri Mulyani Indrawati said. Reuters also reports that there was one Italian citizen on the plane, and one of the pilots, Bhavye Suneja, was an Indian national. 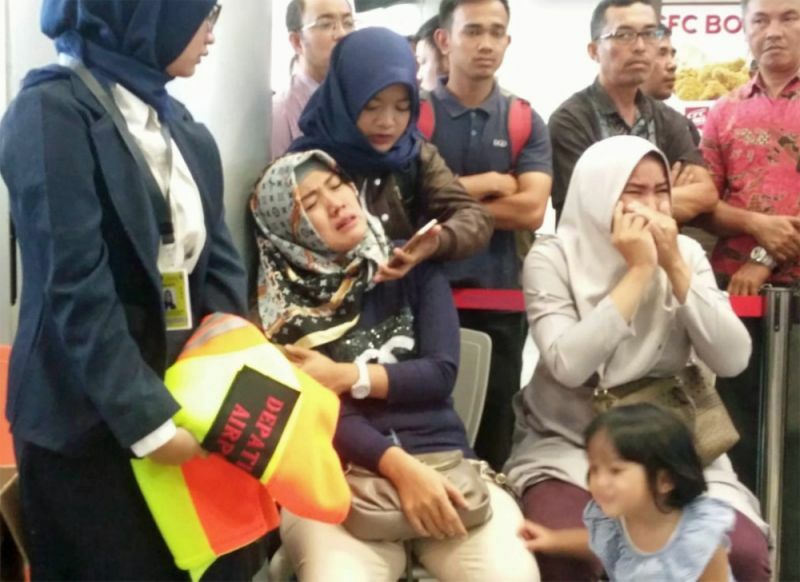 The passengers’ family members previously gathered at the airport in Pangkal Pinang to await news as the search and rescue team looked for wreckage and other remains. So far, Lion Air has flown 90 of these families to Jakarta, and 76 more are on the way. “My prediction is that nobody survived because the victims that we found, their bodies were no longer intact and it’s been hours so it is likely 189 people have died,” the search operation director Bambang Suryo Aji told reporters, Sky News reports. According to a statement by Lion Air, the pilots had amassed 11,000 flying hours collectively and passed all mandatory drug screenings. Suneja had more than 6,000 flight hours, and his copilot, Harvino, had logged more than 5,000 (it is common for Indonesians to have only one name). Aji told reporters that rescue teams are searching a 150 nautical mile radius around the crash site with underwater robots. However, while some wreckage has been found, the main body of the aircraft and the black box (which has flight data and cockpit voice recordings) have not been located. Indonesia’s search and rescue agency, BASARNAS, said that search operations will continue 24-hours a day. Correction: An earlier version of this article incorrectly stated the year of Lion Air’s order of over 200 jets from Boeing as last year instead of 2011. Previous Previous post: The NYT Says its Crucial to Stay Informed: Thanks For the Endorsement!